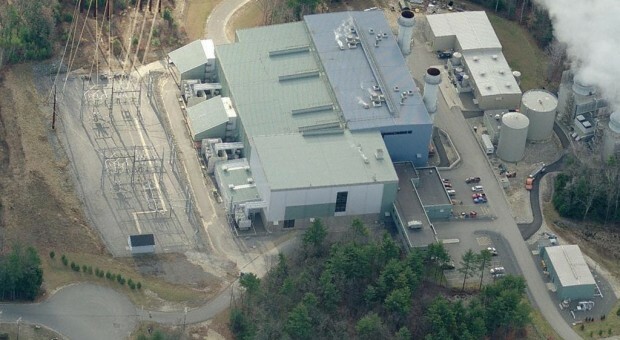 AES commissioned Michael Singer to design the new AES Granite Ridge Cogeneration Facility, the largest in New England, in an eco-industrial park in Londonderry, New Hampshire. This state-of-the-art natural gas cogeneration plant had already been engineered, received all approvals and permits, and was supported by the American Lung Society and the League of Conservation Voters. However, the site design and architectural design had not been completed. AES presented Singer with the challenge to design a facility that would be integrated into the site and eventually be seen as an amenity for the community. Singer formed a team of professionals with the goal of setting new standards for the aesthetics and environmental design for this and future energy facilities. The Singer Team facility design proposed numerous environmental and aesthetic enhancements to the tan colored industrial boxes and storage tanks originally proposed by AES engineers. The plant uses natural gas to generate 720MW of electricity and provides steam to the adjacent Stonyfield Yogurt Facility and other eco-industrial park tenants. Water for the power plant processes comes from nearby treated sewage plant wastewater. The conceptual design proposed nestling the entire facility into the landscape by utilizing berms, dense native plantings and tree groves, green roofs and vine covered screen walls. This was not an attempt to hide the massive facility but rather an effort to integrate and merge the facility with its surrounding woodland landscape both visually and ecologically. The berms and careful shaping of the landscape were intended to preserve existing vegetation as well as balance the necessary cut and fill of soils on site, thus minimizing disturbance and trucking. The rest of the building massing was developed for color and pattern variation as well as natural light and views into the facility. The visitor’s center was conceived as a raised community building overlooking adjacent wetlands. The approach to the facility was carefully developed with consideration of traffic flow safety, public access and views. Consideration was even given to the transmission line right-of-ways which were developed to double as permanent public easements for horseback riding trails linking to nearby conservation lands. AES incorporated aspects of the Singer Team design into the final construction of the facility, most notably the steam and wastewater interconnections, the trail system, the community/ administration building and aspects of the facade patterning, color and massing.